Brac is the largest island in Dalmatia, and with its peak Vidova Gora (778 m) is the highest island in the Adriatic. 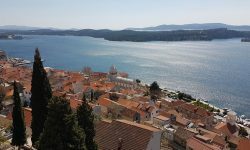 It is located opposite the city of Split and has very good ferry connections, especially in the season. The coast of the island is 175 km long and it has many beautiful beaches and coves. On the southern side of Brac the most famous Croatian beach is situated – Zlatni rat, which is a common motiv used to advertise tourism in Croatia and attract tourists. But it’s not without reason, as the beach indeed leaves visitors breathless. Bol is an attractive tourist resort situated on the south side of the island with beautiful beaches such as the famous Zlatni Rat which because of its unusual appearance attracts visitors from all over the world. Daily Telegraph, the famous British magazine, has ranked Zlatni Rat among the most beautiful European beaches. The beach is pebbly, extends 500 meters into the sea and changes its shape under the influence of wind and waves. The beach is very well equipped with showers, changing rooms, and beach chairs and umbrellas are available to rent. In the shade there are numerous bars and restaurants where you can find refreshment on hot summer days. Numerous entertainment facilities are provided – from renting boats, small boats, equipment for surfing, scuba diving, riding on water skis, on banana boats and various other attractions. Bol is a destination that is focused on tourism, so the offer is really great. If you are looking for privacy, this is something you will not find on this beach. Various agencies take tourists on day trips from other towns just to visit this beach. But close to Bol there are other beautiful beaches that can provide privacy. However, if you are coming to Brac – Bol is simply a must-visit. The beach is located west of the city center and port. 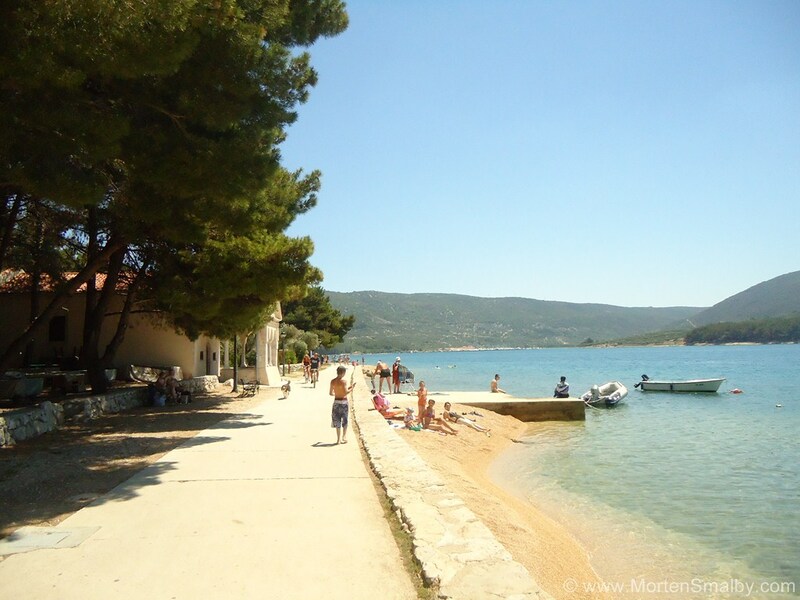 The distance from the waterfront in Bol to Zlatni rat is about 2 kilometers. The promenade leads to the beach, so it takes twenty minutes to get there. Just a few minutes away from the crowded Zlatni Rat is an isolated and peaceful Paklina Beach, a naturists beach without much activites on offer enabling the visitors to completely relax. The shore is pebbled and sandy witha pine forrest in the background which provides you with good shade. In the wider area, around few hundred meters away, you can find some bars and restaurants in case you want to hide from the heat. 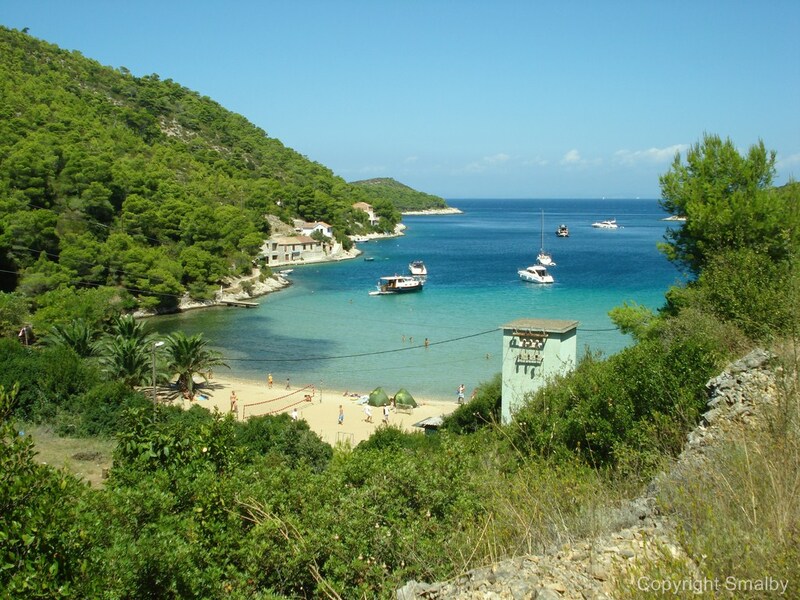 Lovrecina Beach is a sandy beach located about 4 kilometers from Postira. The beach can be reached by car and boat. It is surrounded by pine trees and tall poplars, so the beach has plenty of natural shade. This bay in its sand keeps the foundations of an ancient Roman country villa. Lovrecina beach attracts many visitors on day trips as it is really a beautiful place for rest and relaxation. The sand on the beach stretches almost 100 meters from the shore. Right near the beach is a bocce court, or balote as it is called in these parts. Also in the bay Lovrecina there is a restaurant with a wide range of fish and meat dishes. Supetar is the largest town on the island and the main ferry port. It is located on the north side of the island and opposite the city of Split. Given the really good ferry connections, especially in the season, many tourists staying in Split opt for day trips in Supetar. West of the ferry dock (which is located in the center of Supetar) there is a pebbly beach Vlacica and sandy cove Banj nwhich is suitable for families with children and the elderly. Beaches are interrelated and have access to many facilities such as water slides and pedalo. At Vlacica beach there are several restaurants where you can refresh yourself. At both beaches you can rent umbrellas and lounge chairs. 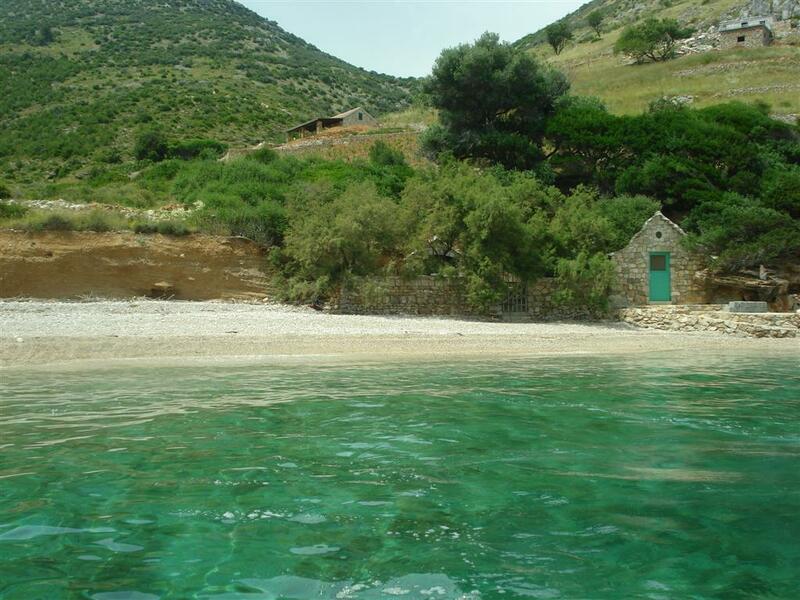 A little further, behind the Svpetrus Hotel there is a long pebble beach Bili Rat and Vela Luka cove. These are also the most beautiful beaches in Supetar. In the vicinity of the hotel complex guests can try the beach volleyball, mini golf, tennis courts, table tennis, etc. On the beaches you can rent umbrellas and sun beds and nearby there are several restaurants where guests can refresh themselves. At the south eastern peak of the island in the municipal Selca, you find several small villages like Sumartin and Povlja, in this area there are several nice pebble beaches, some of them you can reach by car, other (majority of them) you can reach by rented boat. If you are looking to spend a day on the beach away from the crowds, best is to ask the locals which beach to pick, in Sumartin you can ask at the local tourist board they are quite knowledgeable. No matter in which part of Croatia you’re arriving in the summer, check out the best beaches in Croatia.